I had myself a curious problem when I came to disembark from Lady Jane the other day. The wind had been blowing pretty strongly from the west, at about 27 volts, pretty much all day. A west wind has the effect of blowing Lady Jane away from the shoreline. 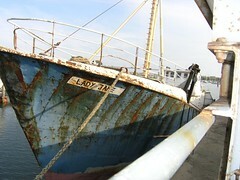 The lines are not kept tight, because Lady Jane rises and falls against the quay side with the tide. If the lines were kept tight, they would just snap as the tide went out. So far this has not been a problem, as I would just haul on one of the ropes and she would drift back to the quay's edge. Not this time, the wind was far too strong! No problem I thought, I'll just get some planking to bridge the gap. 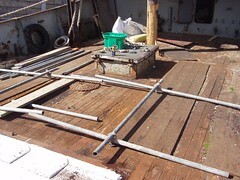 Unfortunately the planks were too short, same thing with the ladder I have on board. Hmm.. In the end, I took my courage in both hands and jumped the gap. There are certainly some very strange web sites about. If you have masses of time to spare, spend a while at cockeyed.com, a classic example of a creative person with far too much time on his hands. I guarantee you will be entertained. Some days are just not as productive as others. This last visit to Lady Jane was just such a day, as I was not feeling too motivated when I got to the boat (I was even contemplating an afternoon nap at one point). 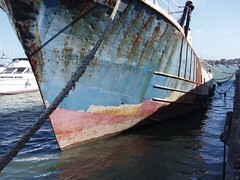 Although there is more to do, at least I've got the worst of the rust scraped off of the port side. Working on the port side is not nearly as pleasant as the starbord side, simply because the only thing to see is the back wall of the agregate yard. I had a welcome distraction in the afternoon, in the form of a young lass who came down to survey the yard then, when she was finished, stopped by Lady Jane for a cup of tea. Both the forward and stern bulkheads have been painted and I'm amazed at the difference this makes. 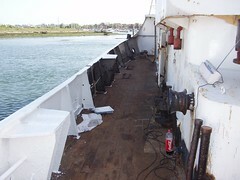 The picture shows the startling change during the painting of the forward bulkhead. One of the things that most surprises me is that as I paint, the things that didn't look so bad are starting to look awful. For example, look at how much the roof stands out in the after picture. Painting the Forth Bridge comes to mind. 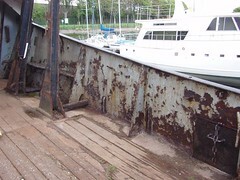 Now all I have left to do is remove the rust then prime and paint the port side. Once that is done, and the whole lot has had a second coat I'll go back to dealing with the hull. I've seen a few spots which would benefit from more rust treatment before I do that second coat though. I've promised myself I'll not take Lady Jane out again until she has been painted, and is looking good. By the way, it looks like the swans have kicked one of their eggs out of the nest. 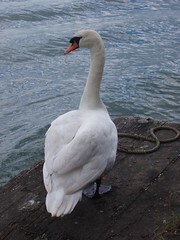 We are now down to seven swans eggs. This is a big moment for me, Mom and Dad finally got to see Lady Jane. 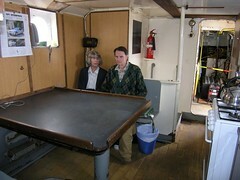 The picture shows them in the galley. You can just see the gas cooker on the right, and through the waterproof door you can see the battery room. On balance Lady Jane gets the thumbs up from them, and I gain another pair of volunteers. Bert, from my local pub, came down to lend a hand with some last minute tidying up on Lady Jane. It must be said, I've never seen Lady Jane looking so good. Bert's visit also serves to remind me just how far I've come, as he was one of Lady Jane's first visitors just after I bought her. Thanks Bert, the help is very much appreciated. There it is, in all it's glory. The throne is now plumbed in and fully operational. My first plumbing job, ever. I've even put a little tap into the pipe on the way to the cistern, just in case. 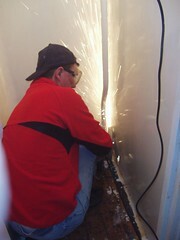 Thanks to Ray from the pub for the advice on Speedfit fittings from John Guest. It made the job so much easier. This particular project is not complete yet. I still need to grind flush and prime the metal where the old fittings have been cut off, give the place a good clean, slap on a second coat of paint then sort out the floor. Oh I almost forgot, I still have to get the toilet light working as well. The toilet flushes out to sea which, while legal in these waters, is not pleasant and will have to be fixed at some point before too long. That will be quite a big plumbing project I fear - Ray, where are you...Ray? Seems like a lot of work for such a small room! Shaun took some time out from his busy farming schedule to come and help on Lady Jane. It's surprising how much faster things move along with a bit of help from someone. 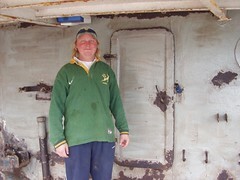 Here you can see Shaun standing proudly in front of the forward bulkhead which he has just finished treating, it's now ready for painting. I think a visitors book would be a good idea, as a way of keeping track of all the people who have visited Lady Jane and who have helped in some way or other. Thinking back, I've had quite a number of visitors already and I have pictures of most of them. 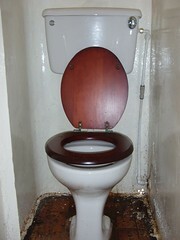 At last, I've got a flushing toilet on board Lady Jane. Now I've not really minded having to get a bucket of seawater every time I've needed to flush the loo, but apparently some people don't really enjoy this particular chore. The picture shows me in the heads, cutting away the last of the previous, and long defunct, flushing system which relied on seawater pumped by the main engine. While the toilet flushes, I've still to complete the plumbing job, as I was mising a vital 90 degree bend for the water feed to the cistern. Hopefully this won't be to much of a task. I am, however, now very aware of just how much water a flush consumes. We are well into spring and boat traffic around Lady Jane is picking up. The little marina near me produces it's share of traffic, along with one or two other boats which venture this far up the creek. I've not really got around to exploring, but think the creek is navigable for another mile or so further up when the tide is in. I was banging away at the rust on the sides, and was surprised to look up and see a police launch turning just behind Lady Jane. I have a clear conscience so I'm just curious, but I don't doubt that there must have been some people close by with their hearts in their mouths. 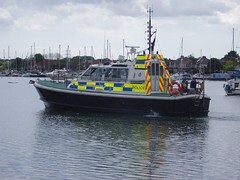 Endeavour, a good name for a Police boat. Just look at how many lights it's got, anyone would think it was Christmas or something! Lady Jane has big potential, I've always known that. Sometimes though, I must admit, I struggle to visualise the end product. How the cabins would be laid out, how things would look and so on. The other day I came across the Wanderbird on the internet. I was immediately struck by the similarity to Lady Jane, except of course Lady Jane has no sails. As well as looking more or less the same, they were both built in the same year, both are about the same length and even have similar engines. The conversion of the Wanderbird looks like a fantastic job, especially the work that has been put into the various cabins. This serves as a huge inspiration to me, knowing that what I'm doing with Lady Jane is, after all, feasible. Not that I've ever doubted, of course. I'm thinking that maybe Kate and I should sign up for one of their 6 day trips in August? The more I think about it, the more I like the idea. Hi Tim. HOW EXCITING! Lady Jane is beautiful! We would love to start a dialogue with you and Kate. We have done this project mostly on our own over the last three years with two more years projected.. Karen and I have put our complete hearts and souls and ALL of our time into this project........and we wouldn't have had it any other way. We would be pleased to be a sounding board for your questions and ideas if you would like. We are so pleased to see what you are doing with Lady Jane. Our vessels appear to be very similar. As I look at some of your photos, (fish hold), I clearly remember being in the EXACT same position. We were in London in February at Earl's Court where we exhibited at the Destinations Travel Show. 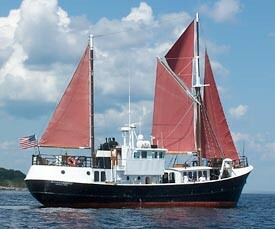 Looking forward to talking more about your fantastic vessel, Lady Jane! I'm very pleased with the effect the first coat of paint has had on Lady Jane. That bit there on the left almost looks good enough to eat. If I had not done it myself, and had not taken the pictures for this blog, such a difference would hardly be credible. While painting I found myself thinking 'why didn't I do this earlier'. The reality is I've pretty much always been busy with one thing or another on Lady Jane, and the learning I've done painting in say the shower room has helped ensure that this particular paint job has gone pretty smoothly so far. Needless to say, progress has been slower than I would have liked, what can I say it's the marine world. I still have to finish the rest of the starboard side, then give it a second coat - probably another two full days work for me, and I've still got to make a start on the port side. My folks arrive in a weeks time and it doesn't look like the weather will hold for the weekend, the reality is I'm running out of time. The muddy swans are doing just fine. Mildred has not been off the nest, that I know of, anytime I have been around, so no update on the egg count. Surely eight is enough anyway? You can see George in the picture, surveying Fareham Creek from the platform alongside Lady Jane. Maybe George is considering a platform upgrade to mine next year, seeing as mine is not nearly as messy as the one they are nesting on. I've got a bit of a priming and painting frenzy on at the moment. In a few weeks I'll have my parents over to visit, the first time I've seen them in years, so now I'm feeling the pressure to get Lady Jane looking as good as possible before they get to see it. To compound things, Kate's parents are likely to drop by for a visit shortly thereafter, so there is double the need for speed. Here you see the inside of the starboard side primed and ready for the first coat of paint. 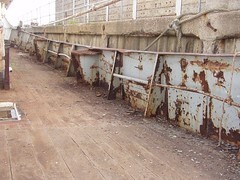 Although they are not really that critical, the sides above the deck are the most visible to visitors, and now look the worst on the boat. The big patch of rust you could see on the outside of the boat has now almost completely gone by the way, primed but not painted. I've chosen to compromise slightly in this phase of priming and painting, in that I'll not work so hard at removing the rust, but simply bash off the worst of it to save time, as I'd rather have Lady Jane looking good for her very important visitors, then spend the time doing the important bits, like the hull, more thoroughly later. Oh, and I've really got to get that flushing toilet sorted! I finally got around to filling Lady Jane with fresh water. 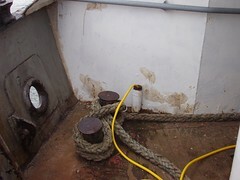 The picture shows her taking on water through the fresh water filler tube, on the starbord side at the stern of the boat. I've not filled Lady Jane with fresh water since I bought her in early July last year, and have been getting increasingly worried about running out of water at an inopportune moment. I don't generally use a lot of water on board Lady Jane, though that will probably change once I've finished with the flushing toilet, it's buckets of seawater at the moment, and the shower room. Ultimately I plan to install a watermaker, helping to make Lady Jane even more self sufficient. According to the figures I have, Lady Jane's fresh water tank is capable of carrying 3000 litres (800 US gallons, 650 UK gallons) of water. I can make all the flashes and do the buzzing noise thing, but my welding ability is still at the 'entry' level shall we say, so when I say I can weld, I mean I now have the facility to weld. At last though, Lady Jane is capable of producing enough power to operate heavy duty electrical equipment such as a welder. This is a major step for me, and the culmination of something that effectively started in September last year, when I first met Robin. 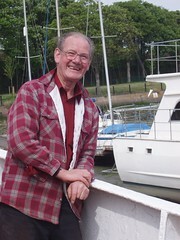 The idea was Robin would come aboard Lady Jane, while she was still moored in the middle of the River Itchen, and do some much needed welding. As it turned out it was impractical to weld on board Lady Jane, simply because I did not have a powerful enough generator. Getting heavy equipment on board was just not possible at that stage, as I did not have either the rib or the lifting gear. 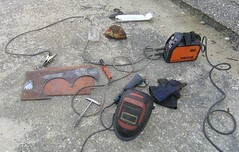 Now I need to buy all the welding gear, similar to that you can see in the picture, so I can crack on and hone my welding skills on various projects. The plate you can see in the picture shows my first attempt at welding in years and years. Not all my ideas are good, nor is my execution always fautless. In this case, the idea was good and my execution was perfect but the result just did not stack up to expectations. I've wanted to do this for a while. My plan was to take a series of pictures, with the camera in the same place, an hour apart throughout the day. The idea being I would make a montage showing the changes the tide makes to Lady Jane during the course of a day. Sadly, the series just came out looking dull. This is one of the last pictures, taken when the tide was in. Maybe I'll try mounting the camera on top of the mast next time, if that fails I'll give up on the idea completely. Just a quick update on the swans. We now have 8 eggs. I wonder how many more Mildred will produce? Did I mention I'm surprised at how big the eggs are? My big plan was to get hold of some scaffolding, to use when working on Lady Jane. The idea was something nice and simple, but solid, which I could put up and take down as I needed it, helping me to reach parts like the top of the bow and stern sections when painting. Scaffolding, how hard can it be I thought? Thanks to the guys at JC Beale, a scaffolding place near home, I have a collection of scaffolding poles, connectors, wooden beams and an assurance that "it's not too hard". The picture shows my scaffolding 'work in progress'. I've quickly learnt that I need to spend more time ogling erections around me, to see how it is really supposed to be done.